When you work more than your contracted time in a pay period, your employer is obligated to pay you at a higher rate or to convert overtime hours to regular hours and pay you at the normal rate. In most places, you receive overtime after 40 hours. For each hour after 40 you receive credit for 1.5 hours at the normal rate. Some employers give you double time, or two times the regular hours, after some specified number of overtime hours. 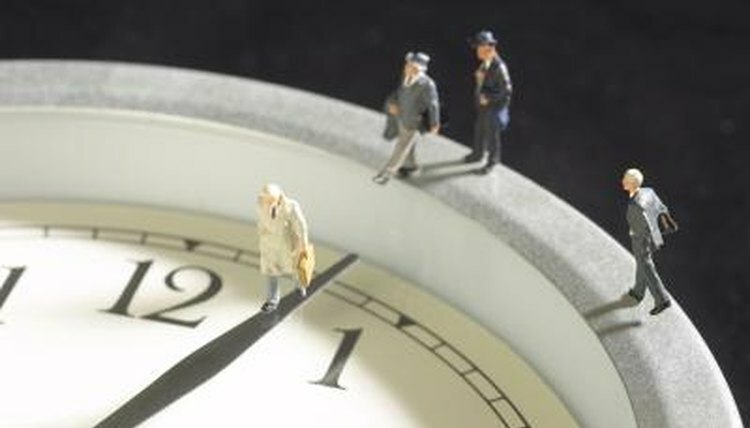 Find out your employer's policy on overtime. For example, some employers credit all overtime at 1.5 times the normal hours. Other employers credit double the hours after a specific number of hours (usually 40). Take your total number of hours worked and subtract 40, and this will give you the number of overtime hours you have worked. On a calculator, multiply the number of overtime hours by 1.5 if your employer always pays time and a half. This will tell you how many regular hours you are to be credited with. If your employer gives you credit for double time after 48 hours, subtract eight from your total number of overtime hours. Multiply this number by two to find the number of overtime hours that are credited at double time. Multiply eight by 1.5, which equals 12, and add this to your hours credited at double time. Belzer, Les. "How to Convert Overtime Hours to Regular." , https://legalbeagle.com/5845129-convert-overtime-hours-regular.html. Accessed 25 April 2019.